I like to decorate tile! I don’t make stockpiles of tile in advance, but rather prefer to do it within the confines of a known project... one that you may have in mind. So, there is a delay for tile which is dependent on my work load and other commissions. I can’t accept “rush jobs.” Once decisions are finalized, it’ll take 3-4 months to complete the request. I especially enjoy making “cameo tiles”... those that will provide rich accents in various settings. It should be made clear that while I can make “plain” tiles, that is not where I want to put my energies. Occasionally I have remainder tile from recently done commissions which are available on short notice, you can see currently available tiles in the SALES GALLERY or just ask, I can send images quickly. 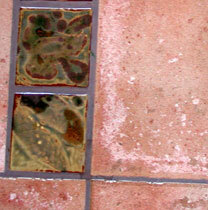 My tile work is priced from $85.00 to $125.00 per square foot, depending on the complexity of painterly details. Many clients use my tile as accents and use commercial tile as the “field” tile. 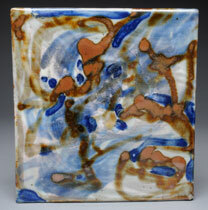 I can make tile in a wide range of sizes as seen on the TILE EXAMPLES page. If special sizes are required which call for making new tooling, there is a reasonable add-on cost which we’ll discuss before the order is placed. A deposit equal to one-third of the project cost is required to begin. Tile orders may be picked up at my studio or shipped to you. We will discuss estimated packing and UPS shipping costs at the time of the order, but clients are responsible for the actual packing and shipping costs when they are fully known. Safety is always a consideration when selecting floor tiles. I use a range of glaze surfaces on my tiles and the tiles finished with glossy glazes are not safe for use on a floor area. The gloss surfaces can be too slippery when wet. If tile is to be chosen for floor locations, more textured glazes are preferred. The drier matt glazes are much more suitable in this situation. Backsplash and counter top locations and other wall tile applications are certainly fine with any of the glaze surfaces I use. Especially if you plan to integrate my tiles in a matrix of commercial tile, we would need to know the thickness of the commercial or “field” tile you intend to use. My tile can be made in 3/ 8 inch and 1/2 inch thickness. Most commercial tile will accommodate these two options. Commercial tiles may be quite varied in size. A 4-inch tile can be a true 4-inch or it may be a “set size” meaning it may measure 3 3/4 by 3 3/4 inches with grout lines bringing the overall set size to 4 inches. We need to talk about these critical size and thickness issues before commercial tile is chosen so that my tile are compatible with what you may choose.